I first hear about Sprout Social when my friend, @jdkunesh (of Fuzzy Math) tweeted about it. I replied to him with questions about it and was quickly contacted by the company itself, saying that the best way to learn about it was to use it. So, I signed up for the 30-day trial, and have been pleasantly surprised by my experience. I (like many of you may be) have been using Klout for a while now. I've been somewhat frustrated by the way my score will seemingly rise or drop at random. Just when I think I've really got something going, my score would be lower by two points. Then, after a short period of neglect, my score would rise. I still think Klout scores are interesting, they're probably just more interesting over the long-haul. While I've only been using it a short while (I'm still within my 30 day trial), I'm already seeing results. 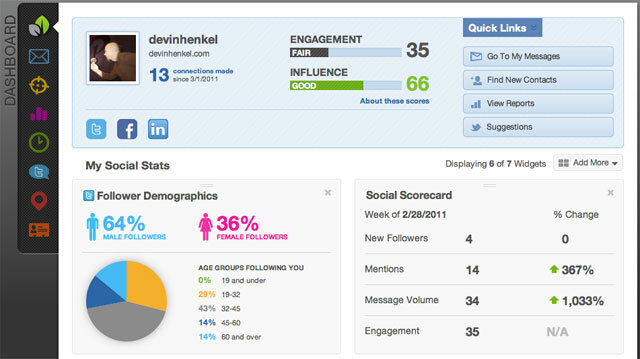 Sprout Social separates your scores into two categories: Engagement, and Influence. Engagement measures the amount of back and forth going on between you and your following, while Influence is a function of the rate of growth and coherence of your following. The formula's pretty simple. If you want to raise your Engagement score, get involved in more conversations with your community. If you want to raise your Influence score, grow your community by adding followers who are interested in similar things. The first thing you see when you login is the dashboard. First, it's well designed and a pleasure to look at. More importantly, it is easy to find the information you need to more effectively engage your following. Next to your profile pic, the two high-level scores are clearly displayed. They are also real-time, so as I was engaging in conversations with followers & followees, I could see my engagement score improve. As you can tell from the picture, it's not great but it's better than it was. As I began receiving follower notices, I saw my Influence score rise. Where Klout's score is a bit of a mystery, it's easy to see what effect your activity is having on Sprout Social. To the right of that, you have links to some tools to help grow your following. Down below you can see some data about the composition of your following, as well as recent data about your activity over time. Below that there are views of recent messages and trending data. All of the views on this page are widgets and can be turned on and off or relocated. I imagine new widgets will become available in the future, as well. This one page provides a pretty comprehensive view of everything you need to know in order to effectively grow and engage your community. Down the left side of the dashboard, there is a palette of other tools. You can use these to view/send/schedule messages, create more in-depth reports, create people/keyword/business based searches for intelligence, monitor locations for brick-and-mortar intel, and even create CRM profiles for your contacts. It seems pretty clear that Sprout Social already provides a powerful Social CRM tool, with the promise of more in the future. Personally, I will continue to use Social Sprout because it has had an immediate impact on the quantity and quality of interactions I've been having. I am not a business with an address, so I will opt for the $9.95/month pricing option when the trial expires. I thin the location-based services would provide great insight to those trying to draw patrons into a place with walls. I'd be interested to hear from someone who is concerned with location who has tried Sprout Social. All in all, you owe it to yourself to give Sprout Social a shot (at least for the 30 day trial). If you do, please let me know what you think.